Plan what you want to get done in detail but be sensible with the goals you set. Also remember that some jobs don’t need doing every year, lofts and sheds for example may need a clear out every two or three years; other rooms may be in need of a de-clutter every year, especially if you have children. 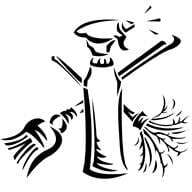 Spring cleaning can be back breaking work and resting before aches and pains become a problem will mean you actually get much more done. Think carefully about every home cleaning task and plan what you will need. Remember cleaning products such as sprays, polish and creams but also supplies including clothes, brushes and gloves. Once you have a list head to the shops and try and get everything in one go to save time; if you need a lot it may be worth going to a specialist store with more choice and better prices. If you can plan to do your cleaning on days when you will remain undisturbed. If you have children wait until they are at school or if they are younger get someone such as a grandparent to look after them. Having time to yourself to do home cleaning at your own pace can actually be quite relaxing if you rarely get time to yourself. In each room start at the top and work down; though you may also want to start at the top of your house a d work down, often leaving your kitchen to last. In each room though during your home cleaning starting at the top means that all cobwebs, dust and dirt that falls will eventually get down to the carpet where it can then be vacuumed up. Tidy away any items not in their places before starting, if things are in the wrong rooms or out of place put them away. Don’t be afraid to throw items away, if in doubt put it aside and then go through everything later. Once something has been taken out and put to be thrown you are less likely to want to put it back into your newly clean and tidy room: unless you really do want it. In each room where objects will get in your way such as rugs, furniture and ornaments clear them away first rather than as you go to give your self a clean run with your home cleaning. Home cleaning can get boring but keep some form of entertainment with you: it could be an MP3 player with a great playlist loaded on to it or perhaps a laptop with a favorite DVD in which you can take with you around the house. Using lots of chemical based cleaning products, they can leave you feeling unwell and make eyes and skin sting after prolonged use: choose products with natural ingredients if possible and avoid bleach especially. Once finished you will want to keep your home looking tidy; create a schedule to keep it tidy and try and get other members of your household to do their part as well. Spring Cleaning Special from European Maids till the end of March. Weekly and Biweekly rates available.